The shuttle sport left teachers thrilled to bits and badminton is set to grow tremendously in Myanmar following Badminton Asia's "Shuttle Time" in the Republic earlier this month. The nation of about 54 million is slowly making a strong comeback in sports at international levels and badminton is one of them. The Myanmar Badminton Federation launched its first BWF Badminton program for teachers and this was Badminton Asia's "Shuttle Time" that was held in three major cities. The cities were Yangon from June 11-12 where 43 teachers participated followed by Mandalay from June 14-15 with 58 teachers and Taunggyi (32 teachers) from June 17-18. On hand to conduct the course were Badminton Asia's development executive Mr. Muhammad Andy Ardiansyah and regional development officer Southeast Asia Mr. Ian Gil Piencenaves. 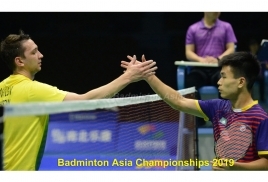 "With Shuttle Time program we really believe that badminton can grow fast in Myanmar. This program will give the children the chance to play the game in the schools. "More importantly they will be able to play the game that it should be played according to its international rules and regulations," said Myanmar Badminton Federation president Mr. Aung Paing at the opening ceremony in Yangon. During the course, the teachers experienced basic badminton skills and fun activities as laid down in the Shuttle Time plans. They were asked to deliver lessons to the children from different schools on the last day of course at all three venues. "We never had badminton in our schools before. Thanks to our Federation and Badminton Asia for giving us the opportunity on how to deliver badminton activities to our students," said one of the participants. Andy described the Shuttle Time program as "successful and left the participants satisfied, confident" in carrying out their badminton activities. "They (participants) were excited to deliver the lessons at each stop during course," said Andy.